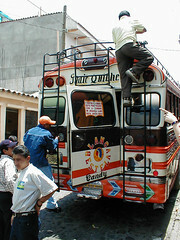 "Guatemalan buses are always brightly decorated and the decorations contain frequent references to traditional culture and Christian religion; in this case the sign of the back notes that the bus is protected by the "blood of Christ." Buses are the primary mode of transportation between cities and towns. Each bus is run by a drive and one or two porters who load and unload luggage and transported goods from the top of the bus."